You’ve bought your first caravan, and you want to make the most out of it, so here’s our guide to keeping your caravan in top condition and ready for those last minute getaways. Once a year, you should book your caravan in to your dealership where they will carry out its annual service, checking the electrics and mechanical elements as well as habitation area including the gas and water systems. Maintaining your caravan could also prevent accidents from happening such as tyre blowouts or handbrake failures. It could therefore save you making an avoidable claim on your caravan insurance and so keeping your no claims discount intact and your caravan insurance premiums low. 1. Open and close all the windows and doors, including cupboard doors, and oil the hinges. Check window seals for any signs of damage such as cracks or condensation. 2. If your caravan has been stood for a while, remember to charge the battery before you plan to use it. 3. Another important thing to check, if your caravan hasn’t been used in a while, is the tyres. It’s an all too common problem with caravans as they’re often left for long periods, exposed to the elements and tyres can become damaged. To minimise the risk of a blow-out, check tyres for any signs of perishing, cracks in the side walls or suspicious bulges. Any tyres showing signs of damage should be changed immediately, even if the tread isn’t worn. 4. Clean your caravan inside and out. It’s a good idea to do this before you use it and when you return from holiday, so it’s clean when it goes back into storage. Protect the outside of the caravan from the elements by using a specialist caravan cleaner and wax polish. The inside should be vacuumed regularly and the inside of the cupboards cleaned. Make sure the fridge is empty, then wipe out with some bicarbonate of soda, then leave all cupboard and fridge doors propped open to allow air to circulate. Take down and wash all curtains and clean upholstery if necessary. 5. Check all the electrics by connecting them up and making sure all lights (including brakes and indicators) are working correctly, replacing any broken bulbs. 6. If you have a caravan awning, it is worth taking it out of the caravan to check that there are no bits missing and there is no damage to it. It’s better to find out at home than when you’re pitched onsite! 7. Check the handbrake on the caravan to make sure it is working correctly and hasn’t seized. If it feels like it could seize, or is difficult to take off, apply a lubricant to the mechanism. 8. Couple up a gas cylinder so that all the appliances can be checked. This could include, the fridge, cooker, hob and heating system. 9. The water system should be cleaned out after a long period in storage. Use a sterilising fluid to flush through the system before using your caravan. 10. If you notice any damage to your caravan, get it seen by a professional. Don’t wait until the week before your holiday to book it in at your dealership as they’ll be extremely busy over the summer months, plan ahead to ensure your holiday is hassle free. Want more handy hints and tips? 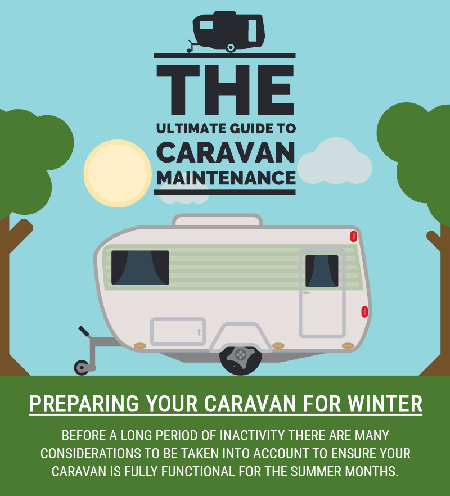 Click the image below to reveal The Ultimate Guide to Caravan Maintenance infographic from our friends over at Canopies UK or take a look at the interactive guide online. as a true new beginner i found this guide to be extremely helpful and useful. i never even thought of them . thank you !